Advances in Genetics provides the latest information on the rapidly evolving field of genetics, presenting new medical breakthroughs that are occurring as a result of advances in our knowledge of genetics. 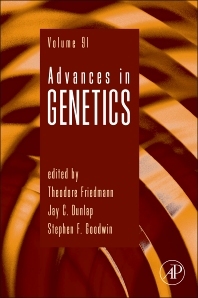 The book continually publishes important reviews of the broadest interest to geneticists and their colleagues in affiliated disciplines, critically analyzing furture directions. Dr. Stephen Goodwin works at the University of Oxford.